Extracted using a cold-press technique. It has lots of benefits for: Skin & Hair Care: It is easily absorbed and is a natural moisturiser, therefore suitable for all skin types. It is rich in vitamins and as a result is great for the skin. It balance moisture and helps to nourish the skin. Since almond oil has a very fine texture it does not leave skin feeling greasy and does not blocks pores. It gives a uniform complexion and removes dark circles under the eyes. Massaging a few drops into the scalp adds a healthy glow to hair. Also, it helps make hair stronger, thicker and adds shine as well as nourishing and smoothing hair cuticles. 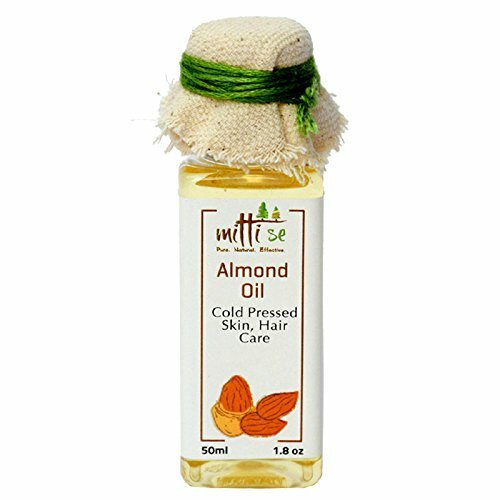 Almond oil also facilitates hair growth. Almond Oil can be used as a massage oil and can be mixed with other massage oils. It strengthens bones, muscles and skin and also provides relief from muscular pain. It is a good baby massage oil. Can be used directly for babies body and head massage. It can be mixed with Sesame, Olive or Coconut oil for body massage. Culinary Usage: Almond oil is high in mono-unsaturated fats, omega-3 and essential fatty acids . It can be used in salad dressings for cooking meals like stir fry. It also does wonders for our digestive system by increasing the good bacteria in our stomach. Almond oil is great for digestion, and can also an effective laxative. Two tablespoons of almond oil taken twice a day can prove to be helpful, but it shouldn’t be continued for more than a week at a time. It is also great for boosting the immune system. It is completely safe for infants. Usage: As required, for Body/Hair Care or Culinary purposes. Avoid Sun immediately after using on skin. Can be used for infants and adults. Ingredients: Pure Oil of Sweet Almonds extracted using cold press technique 100% Natural & Handmade, Free from Harmful Chemicals, No Animal testing, Vegetarian, No Added Preservatives, Colors, Fragrance. Edible- Can be used raw for salad dressing.